Six agencies released a Joint Release “Agencies Issue Proposed Rule on Minimum Requirements for Appraisal Management Companies”. The release, and its attached Proposed Rule, list five AMC requirements that participating States must enforce, as well as six broad powers the States must have related to monitoring, disciplining, and reporting. The Joint Release also points out to States that participation is not mandatory; non-participation by a State would bar appraisal management companies from doing business in that State related to federally-related transactions. Read the Joint Release and the Proposed Rule. The Proposed Rule contains instructions for comment. WASHINGTON— Six agencies today issued a proposed rule that would implement minimum requirements for state registration and supervision of appraisal management companies (AMCs). 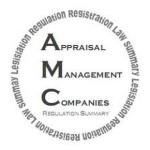 An AMC is an entity that serves as an intermediary between appraisers and lenders and provides appraisal management services. Report an AMC’s violation of appraisal-related laws, as well as disciplinary and enforcement actions, and other pertinent information about an AMC’s operations to the Appraisal Subcommittee of the Federal Financial Institutions Examination Council. In conjunction with the proposal, the Federal Deposit Insurance Corporation is proposing to rescind appraisal regulations promulgated by the former Office of Thrift Supervision (OTS). The OTS appraisal regulations are duplicative of the FDIC’s appraisal regulations in Part 323. Similarly, in a separate rulemaking, the Office of the Comptroller of the Currency is rescinding appraisal regulations promulgated by the former OTS. This entry was posted on April 1, 2014	and is filed under Appraisal, Appraiser, Appraiser's Guide, Legal, Opinion, Rules and Regulations. Written by: Josh+. You can follow any responses to this entry through the RSS 2.0 feed. You can leave a response, or trackback from your own site.